When ketones are treated with secondary amines and heated with an acid catalyst, a condensation reaction occurs, resulting in the loss of water and formation an enamine. Condensations are processes in which two molecules are joined with the elimination of water, such as this reaction of enamine formation from a secondary amine and an aldehyde or ketone. This reaction takes place under acidic conditions and enamine which is formed consists of functional group incorporates both the ene function of an alkene and the amino group of an amine. 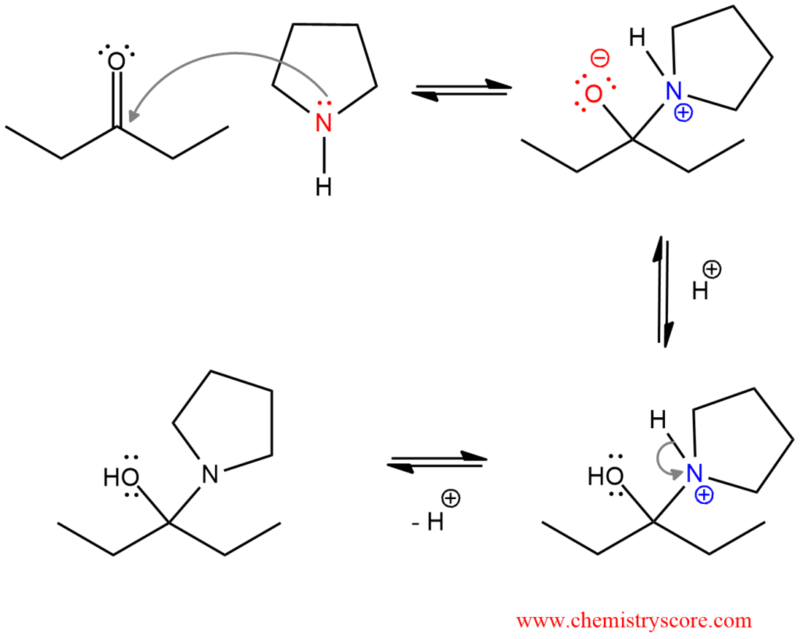 The mechanism is the same as the imine formation mechanism. In the first part of the mechanism, the nucleophilic secondary amine is added to the electrophilic ketone. The negatively charged oxygen is protonated and positively charged nitrogen loses one to give the hemiaminal intermediate. In the next part, comes to a conversion of hemiaminal to enamine with an elimination of water. By protonation of the hydroxyl group, it is modified into a better leaving group (water). The loss of the water leaves iminium ion. Deprotonation in α position (α carbon is in adjacent to the carbon atom which is bonded to nitrogen) generates the final product enamine.